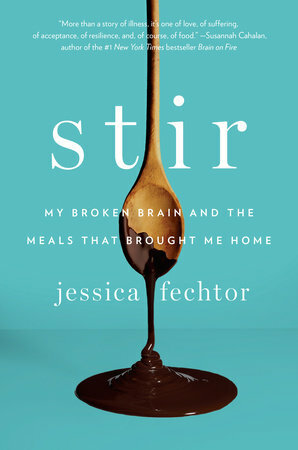 Stir: My Broken Brain and the Meals that Brought Me Home by Jessica Fechtor is the December/January selection for Cook the Books. Deb from Kahakai Kitchen is the current host. I am so glad she picked this book. I really enjoyed it, Deb! Jessica Fechtor must be a remarkable person. She is, no doubt, obviously resilient. Fechtor relates her very personal journey of recovery in very intimate ways. As a fit and active twenty-something, she suffers a brain aneurysm while away from home at a conference. That she survived the aneurysm in itself is a heroic tale, but Fechtor also faced physical therapy, a severe infection, numerous surgeries, the loss of sight in one eye, and her loss of smell. Along the way she has her devoted family and friends around her. Fechtor traces her recovery and reminisces about her life through recipes and meals. Her voice and tone carry a casual familiarity and I felt like I was listening to a close friend. 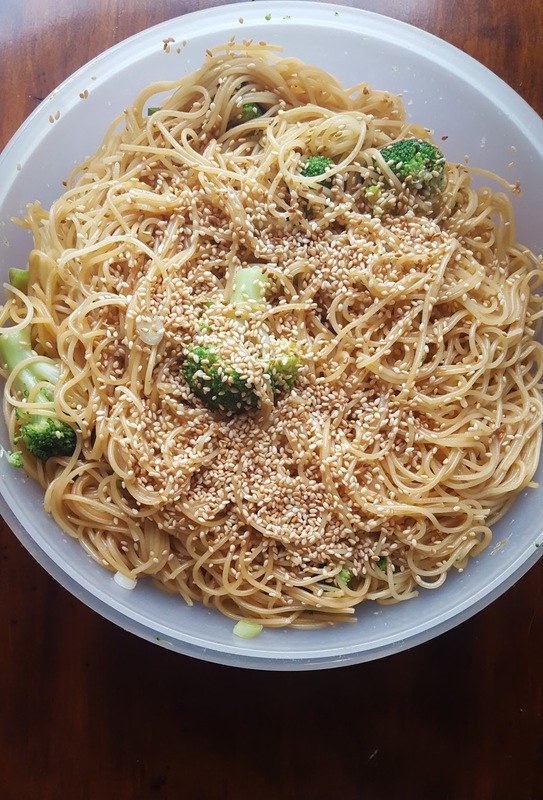 Since we are on a rice bowl diet that focuses on veggies, I decided to make the sesame noodle dish that she highlights in Chapter 25. 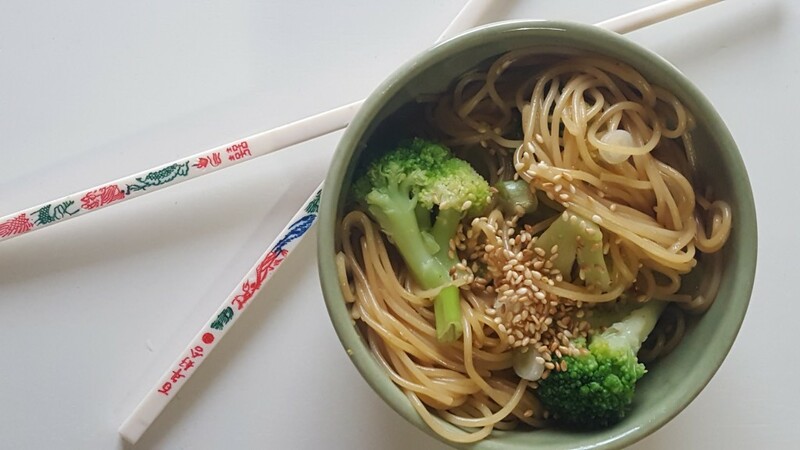 I did swap out the sugar and added honey and threw in some broccoli for a healthier meal. Steam broccoli and cook pasta according to directions. 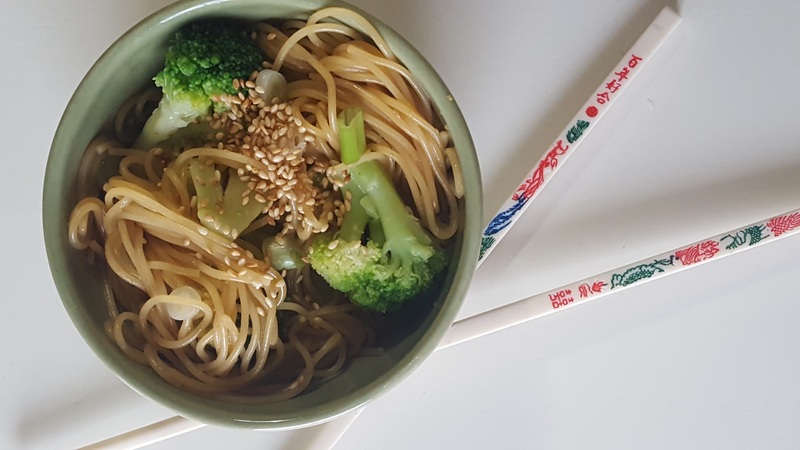 While broccoli and pasta are cooking, place the minced garlic, honey, vinegar, soy sauce, and sesame oil in a blender and pulse until blended. Set aside. When pasta is cooked and drained, place it in a serving boil. 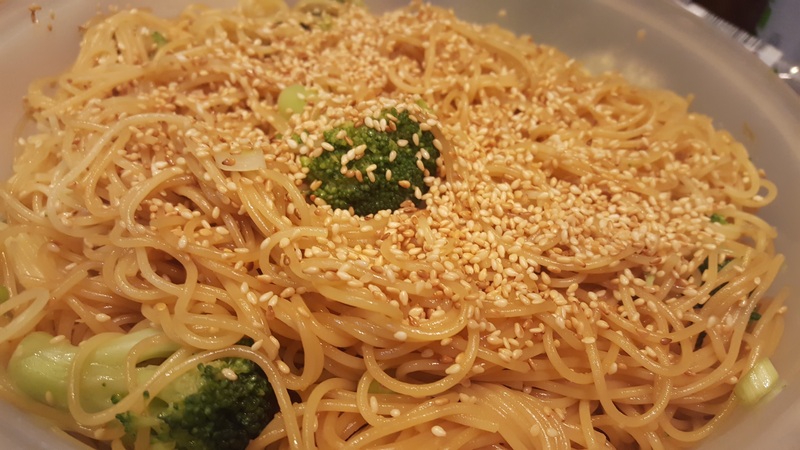 Toss pasta with sauce, broccoli, and green onions. Garnish with sesame seeds. This dish can be served hot, at room temperature, or cold. This makes a large bowl of noodles, perfect for a pot luck. I ate the leftovers the rest of the week as a cold salad which is how I prefer this dish. I love the color and the textures found in this dish. From my own experiences with a wolf of a different kind, I knew that she was onto something. To trust in your own aliveness, in your own ability to sustain and be sustained—there are times when there is no greater act of defiance. Fechtor certainly must have embraced defiance while meeting all of her health issues with resiliency, grace, and gratitude. Again, thank you, Deb, for hosting and selecting this wonderful book. I have been passing my copy around the office and so far everyone is enjoying Stir. You can read my other Stir review at Goodreads. Sharing this with Deb’s Souper Sunday at Kahakai Kitchen. I love what you have been cooking, Debra…healthy, delicious and lots of great flavours! Thank you, Angie. I am really loving cooking these new healthier things, too. It’s amazing what you can do with rice (and noodles). This sounds delicious, we love broccoli !! Snow peas would be great in this as well. Thanks, Gloria. I think I like it cold the best! Another cookbook. YAY!! This looks like a great recipe! Oh, this is more than a mere cookbook! It is a sensational and poignant read. Hope you pick it up. I thought the book was great as well, and like the changes you made to this recipe. Even more veggies wouldn’t hurt! I’m trying to incorporate more meatless meals around here. I agree on more veggies, Claudia. I would love to try it with snow peas. I enjoyed the book as well, even though it was a difficult story for me to read. Love Sesame Noodles and like the fact that you added broccoli to the mix. That looks so good! I very nearly made that recipe as well! You should try it, Amy. This is another of the recipe I saved to make. Haven’t made it yet but maybe it would be a good thing for our lunch tomorrow at work. Great book, good story, wonderful recipes. I loved it. I really prefer this dish cold—it’s perfect for lunches, Tina. Sad face,…..I thought the almond cake from the book was most worthy, too. I also liked the references to How to Cook a Wolf, my favorite M.F.K. Fisher’s book. Great choice of recipe! These look delicious!! I’m going to feature them on Instagram because not only do they look delicious, it is a beauty of a photo! You are too kind, Kelli! Thanks!!!!! !